Boxing Day is December 26! Yes, today is Boxing Day "
on which postmen, errand boys, and servants of various kinds received a Christmas box of contributions from those whom they serve" (Charles Dickens). Surely there are plants for celebrating Boxing Day? According to the CanadaInfo web site ("over 300 pages of information about Canada!") "
." There we go: oranges. Probably the same ones they used to fill the toe of the Christmas stocking the day before. Where did the Victorians get oranges in winter? Perhaps imported from Spain, or grown in the orangerie--a special greenhouse used to cultivate citrus for the fragrant blossoms and exotic fruit. Some citrus will flower off and on at any time of year, especially 'Meyer' lemons and kumquats, and both of these are slow growers especially suitable for growing in pots. Most citrus have beautiful colorful fruit in the winter, so they show up in many seasonal celebrations and recipes, especially those of Asian, Pacific, and Mediterranean cultures. Bags of oranges and mandarins are traditional gifts anytime during the two-week Chinese New Year's celebration, symbolizing happiness, while kumquats symbolize prosperity. 'Dancy' is the tangy, seedy Christmas tangerine of my childhood. 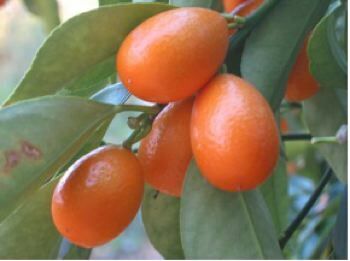 'Owari Satsuma' is the nearly seedless, sweet mandarin orange. Both grow very well here, and kumquats are the hardiest, easiest, and most ornamental citrus of all. Other unusual and hardy citrus with showy holiday fruit include the Rangpur lime (actually a sour mandarin) and the Calamondin (Kalamansi in the Philippines, another prolific sour-fruited small orange). Of course, oranges, grapefruit, lemons, some limes, tangelos, and pummelos all grow readily here, and new summer-fruiting citrus extend the harvest season. All have shiny evergreen foliage, fragrant flowers, and attractive fruit. Simmer some cut up citrus peel, a cinnamon stick, and a few cloves to scent your house on a gloomy winter day. One citrus with special holiday significance is citron, the fragrant, thick peel of which is one of those mysterious candied objects in fruit cakes, and the small-fruited 'Etrog' citron is used in the Jewish Feast of the Tabernacles. A bizarre citron with finger-like fruit is the 'Buddha's Hand', grown in China and Japan for the fragrant fruit. I remember a vigorous argument at the Christmas dinner table between my father and grandfather--both very smart and very stubborn men--about whether citron is a citrus fruit or a melon. They were both right. For the record: much of the citron sold for fruitcake in the United States is the candied peel of a small, thick-rind watermelon. Anywhere people gather in the winter they cut local flowers, berries, and leaves to decorate their homes, and soon you have a holiday tradition. Stick them in a greenhouse and you have the makings of a big industry (nursery crops were valued at over $3 billion in California in 2001). After all, how did a roadside weed from Mexico (Poinsettia--Euphorbia pulcherrima) become the ubiquitous symbol of the season? This lanky shrub initiates flowers in response to increasing periods of darkness, providing bright red bracts (the colorful leaves around the tiny flowers) in winter in Southern California and other frost-free areas. Growers long ago learned to control flowering by screening plants in a greenhouse with black plastic (this is why you see mums in bloom in stores all year). Flowering of Poinsettias involves 14 hours a day of total darkness for several weeks from late September on. Even an incandescent light bulb on for a few minutes can stop the process, so Poinsettia growers can't be sloppy! What should you do with them after the holidays? Enjoy the plant indoors until nearly March, then cut it back, repot it, and move it outside to partial shade if you want to grow it on for next year. Then try to remember to start the dark treatment in late September. Or just let the grower do it and buy a new one next year. Controlling the length of darkness (called the photoperiod) allows growers to time the production of other holiday plants. Thanksgiving and Christmas cactus have interesting flowers in shades of pink, lavender, orange and white. These are two different species of Schlumbergera, usually called Zygocactus (an old botanical name) and now thoroughly interbred so they are just called Holiday cactus. Rhipsalidopsis is a related cactus that blooms in spring, so it's called Easter cactus--at least until we become truly ecumenical and call it Spring cactus. Confused yet? It gets more complicated, as the bloom is a response to an interplay of day length and temperature. Unlike Poinsettias, these WILL set flower buds during cool fall nights even if there is light, but won't set buds if it's too warm (such as inside your house, so don't bring them in too early). They will drop the buds if it's too cold (such as outside in the winter). Consequently, successful holiday cactus are kept year-around in screened porches where they can flower in response to the declining days and temperatures, or are brought indoors after the buds begin to develop. 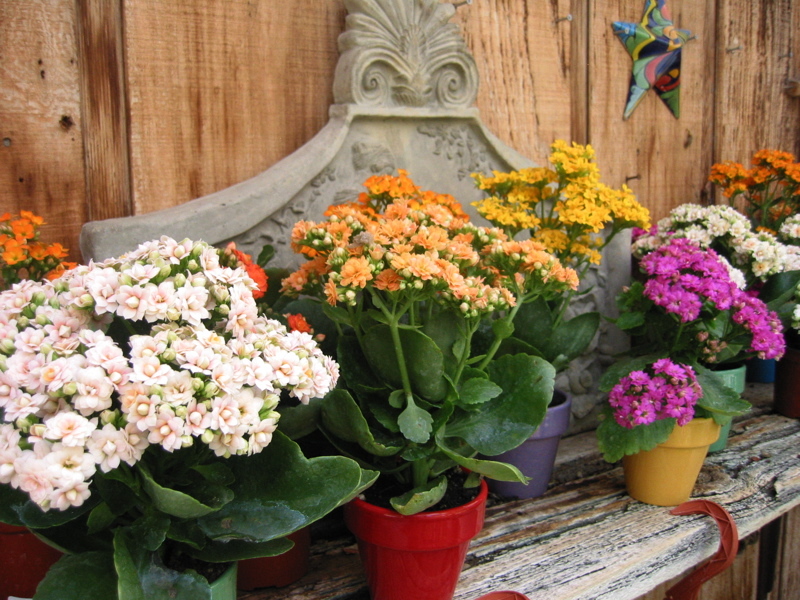 Kalanchoe (right) is a photoperiod-sensitive succulent with vivid, neon flowers in 1970's colors. Easy to grow but too tender to leave outside during the winter, it is hardy enough for the porch. Our mild temperatures enable us to easily grow winter flowers that gardeners in colder climates have to protect. 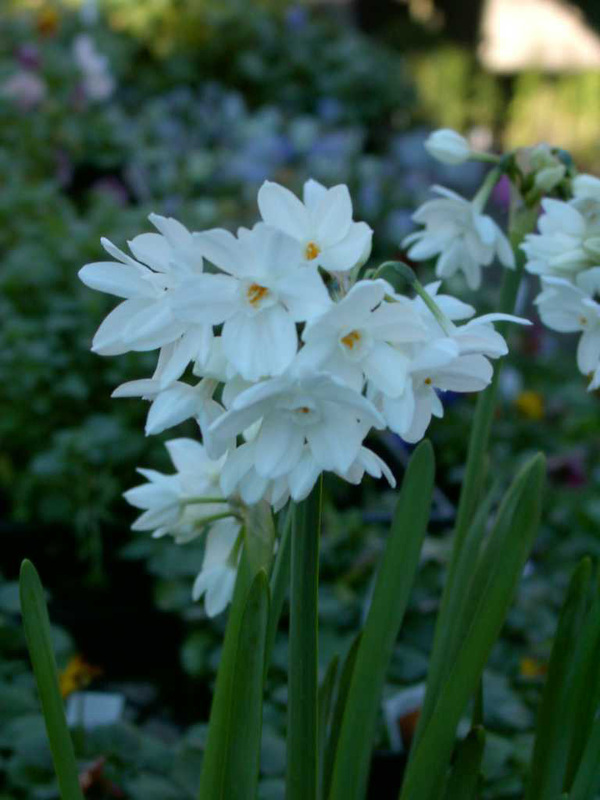 For example, paperwhite Narcissus (left) are often "forced" into bloom indoors in snowy regions for their powerful, sweet scent. You scarcely have to force them here. These subtropical relatives of daffodils naturally flower here in late fall and early winter--often as early as November, indoors or out. You can make them bloom indoors in just 8 - 10 weeks by setting them in rocks and water. Stick them in the ground or in a large pot after they've bloomed, allow the foliage to grow out and then die down naturally in late spring. They will multiply freely in the garden and bloom year after year. Oranges and winter flowers in your back yard are part of what originally lured folks to the Golden State! So, I invite all our Canadian and British friends to stop by this Boxing Day. Bring us the gifts and money, and we'll give your kid an orange. Or maybe a mandarin. Want to grow your own mandarins? More info here!